Jackie & Ryan Movie Sometimes they stay. Sometimes they go. Jackie & Ryan release date was Friday, July 3, 2015. This was a Limited in theaters release. 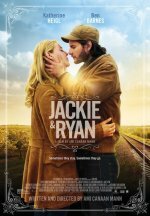 Ryan Brenner (Ben Barnes) a travelling musician and Jackie Laurel (Katherine Heigl) a former singer at a crossroads in her marriage, have a chance encounter while Ryan is busking on the streets of Ogden, Utah. After a sudden car accident propels them together, Ryan finds himself at Jackie's house for dinner. Ryan's battling to find the courage to write his own music while Jackie's fighting for independence from her estranged husband who wants her to return to their upscale Manhattan marriage. When Ryan's musician mentor dies in a train accident and Jackie's husband threatens to take custody of her daughter, Ryan and Jackie find the strength and music they need in each other. What they don't know is, if the paths they choose will lead to one another. added the tagline: "Sometimes they stay. Sometimes they go."